“Cages or wings? Which do you prefer? Ask the birds.” -Jonathan Larson, Tick, Tick… Boom! When I was a little girl, I truly believed that a viable career option was to become an elf in Santa’s North Pole Workshop. Whenever I was asked, “What do you want to be when you grow up?” that was my proud and determined answer. As I got slightly older, I remember flying on a plane with my family and reading an article in the in-flight magazine titled, “Highest Paid Jobs in America”. On the shortlist was the CEO of Heinz Ketchup. Now, my priorities at that age had somehow shifted from a job I was passionate about to a job that would make me financially set for life. It never seemed unreasonable to my nine-year-old mind that I could someday be the CEO of Heinz Ketchup. After all, I loved ketchup, therefore I was certainly qualified. It also never occurred to me that becoming CEO of any major corporation was outside of my reach as a woman. Women have come a long way, it’s true. We won the right to vote, we won the right to work, we won the right to fair wages (though not always equal), we won the right to serve in the military or play on baseball teams or dress as a hotdog on Princess Day in ballet class. The sad thing is that we had to fight to “win” any of these things. Women have marched and fought and worked to earn these basic human rights that should have been ours all along. The social standard of what a woman was “good for” or “able” to do or “smart enough” to do or “strong enough” to do has expanded thanks to many women (and some men!) kicking and punching their way through glass ceilings and legislation, facing much backlash and resistance every step of the way. And those pioneers who took the first brave steps for the good of us all were often met with the hardest opposition. 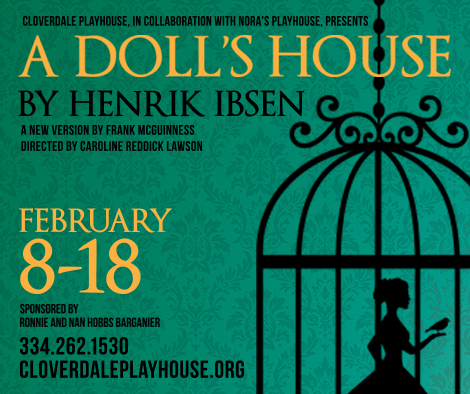 The Playhouse’s first play of the season is Henrik Ibsen’s A Doll’s House. This play, written by a Norwegian playwright living in exile in Germany in the 1870s, brought to life a character who would become one of the first female heroines of modern drama: Nora Helmer. Even as a fictional character (though sources say she was based on someone very real), Nora’s journey in the play created much turmoil, resistance, and harsh criticism from audiences, men and women alike. Nora, a woman who plays at being the perfect wife of a wealthy husband, spends much of the story seemingly shallow, flirty, giggly, and begging her husband for spending money. Her husband treats her like a doll in a box, giving her pet names like “my little bird”, “my little squirrel”, and “Miss Sweet Tooth”. He scolds her and speaks to her as if she were a small child incapable of understanding grownup things. For a time, she seems content with this life. Why wouldn’t she? It was the status quo for centuries, right up to the 1950s. Cut to: Ricky Ricardo losing his temper because Lucy buys another hat. Today, women still march for we have a long way to go. Today, we have movements like #metoo and #timesup, Congresswoman Maxine Waters’ need to “reclaim her time”, Senator Elizabeth Warren’s silencing that led to the “nevertheless, she persisted” rally cry. These brave women and many more fight every day for each inch of equality and respect. Every woman has her own stories. Ask them. We’ve all had to fight in our own way. I have been minimized, underestimated, harassed, diminished, groped, put in a box, and undervalued more times than I’d like to remember. I’ve had to endure people reducing my successes and reveling in my failures. I’ve had people direct their questions to the nearest man in the room rather than me, even when that man has no authority or answers. Things like that happen constantly, and I’m sure the last time was not the last time. And my experiences aren’t unique ones, nor are they the worst ones. But each woman’s battle matters. The struggle makes us stronger and more determined. Our production of A Doll’s House will ruffle feathers. That is the tradition of the play. You are going to be affected. The story and its controversial ending will make you feel something and make you think. Our hope is that it will also open up a door for a conversation. Tickets for A DOLL’S HOUSE at the Cloverdale Playhouse are on sale now. The show runs from Feb. 8-18, Thursdays-Saturdays at 7:30pm and Sundays at 2pm. Visit www.cloverdaleplayhouse.org or call the box office at (334)262-1530 for more information. Hats off, Sarah, for telling it like it is. And I can hardly wait to see the production opening night!